Amanda Harton had considered joining the NSW Police Force for many years but it was the advice of a dying friend that gave her the push she needed to complete her Associate Degree in Policing Practice. 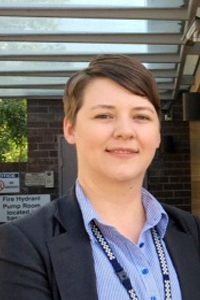 Now a detective working on a homicide strike force, Amanda recently completed her Bachelor of Policing and is keen to take on further study with a Masters. Here Amanda shares why she is passionate about being a police officer. While I wasn’t the first in my family to attend university, I was the first to graduate. This was an incredibly proud day for me and my parents and is a moment in my life that I’ll never forget. At school I... talked too much in class. My childhood was fun, always playing sports and swimming in my grandparent’s pool every summer. I chose CSU... because I wanted to be a police officer and enter the Police Force with an Associate Degree in Policing Practice. My best experience with CSU... was travelling to Wales in the United Kingdom for a week long study tour with a small group of police officers from many jurisdictions around Australia. I met UK policing students along with German police officers and was able to make comparisons between our policing model and theirs. I also happened to meet my partner while there, so I would say it was definitely the best experience. My worst experience at CSU... there wasn’t one really. Except leaving essays on the odd occasion to the last minute and needing to stay up late before an early day shift to get them done. At university I was inspired by... my father who is well respected throughout the world in his chosen career. I have watched him work so tirelessly to get to where he is today, I think that is inspirational. Today I’m motivated to... commence a Masters degree. In my profession it is important to... have the highest integrity, act with care and diligence, and ensure that the authority granted to us is always exercised responsibly. I never dreamed I would... be a detective. I am passionate about what I do because I love my job. If you love what you do, it makes it easy to get up and look forward to going to work every day. The job is rewarding, it changes day to day and you definitely never get bored. I’m most proud of... graduating with a Bachelor degree from CSU. It was hard for me because I was already working full time in the police when I decided to go back to uni and complete the degree. In the future I’d like to... complete my Master degree and possibly move into academia. The best piece of advice I ever received was... from a friend of mine on the day he died. He said “What are you waiting for? Join the police force and do something great with your life”. The thing I wish I had done but never got around to... nothing really because I’ve travelled the world, marched out of the parade ground in Goulburn and graduated from university. If I could do it all again... I would because I had a blast, although I’d prefer not to eat the food at the police college again! One last thing... the academic requirements, fitness tests and defensive training all in one day, over many months, made it tough in Goulburn, but it’s all worth it. If you’re thinking about joining the police or studying policing, don’t put it off like I did because you really are missing out.